A while ago, I wrote about the wonders of having multiple VLANs at home, operating in a mixed “hybrid” access model. While it was great, I made a comment that simultaneous VLAN operation might not be possible under Windows depending on the NIC involved. 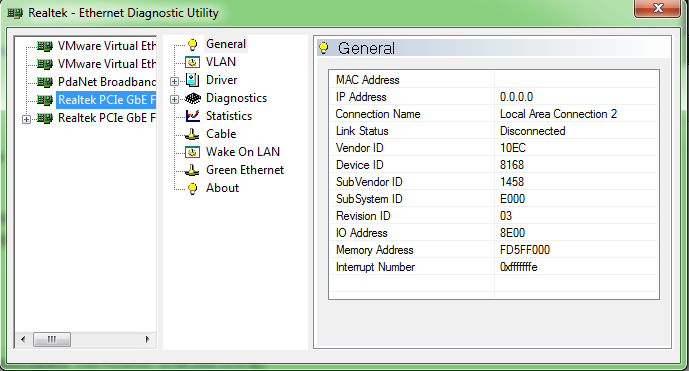 While I had a late-model Intel NIC on my main desktop which happily supports Intel Advanced Networking Services, allowing me to participate in multiple VLANs at the same time through a number of virtual adapters, I noticed some other NICs only had one VLAN ID entry within their advanced driver properties. Owing to a new project, I suddenly had to re-commission my former desktop. The Gigabyte 890FXA-UD7 uses a dual GbE LAN solution based around the Realtek RTL8111D solution. The problem was that the driver property pages had no VLAN entry! 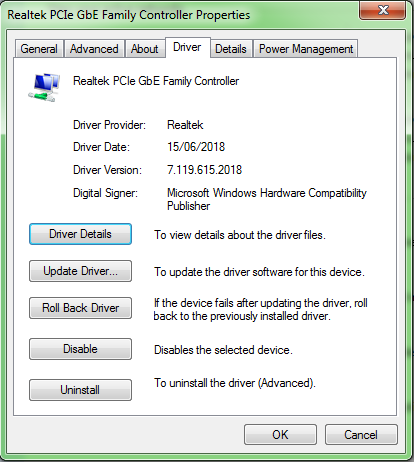 I checked the usual culprits – namely updating the driver to the latest version on Realtek’s website. Unfortunately, this didn’t change the situation at all. According to Gigabyte’s website as well as Realtek’s product page, the solution supports VLAN tagging – so what gives? 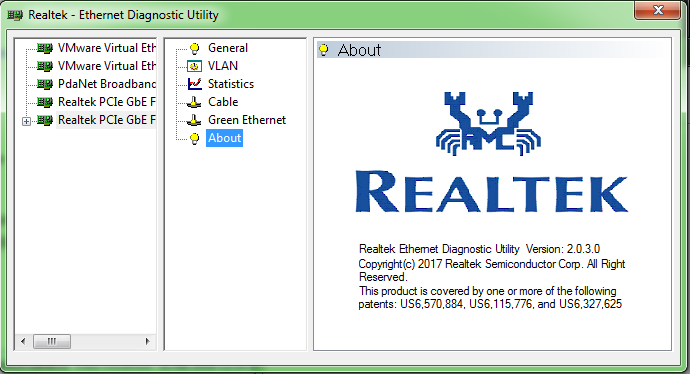 The answer to the VLAN problem lay in an unexpected place – the Realtek Ethernet Diagnostic Utility. The tool can be downloaded on the same page as the drivers for the NIC. 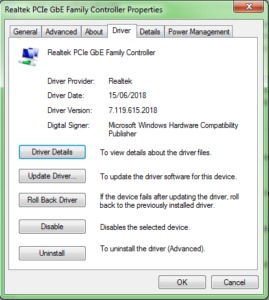 I’ve never bothered to download or install this, as a “diagnostic utility” is usually used to diagnose issues with the network adapter, drivers or cables – none of which I’ve ever really had any issues with. As it turns out, the diagnostic utility is both a diagnostic utility and a tool for configuring virtual interfaces and VLANs. 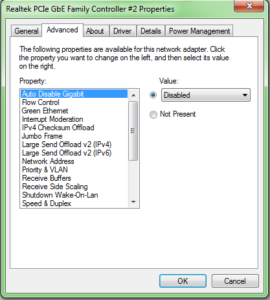 This can be done through the VLAN page, which allows you to add a new VLAN to be member to (which automatically installs the appropriate driver and creates a new virtual interface). 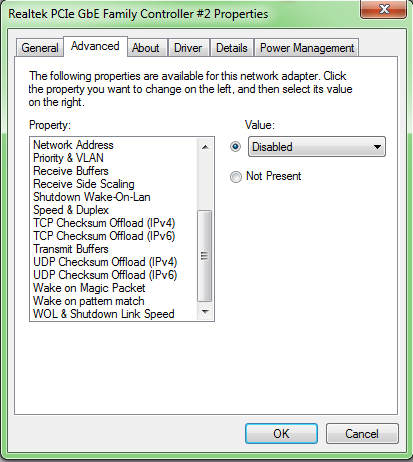 You can also change the MAC address of the virtual adapter in case it’s necessary to avoid conflicts. 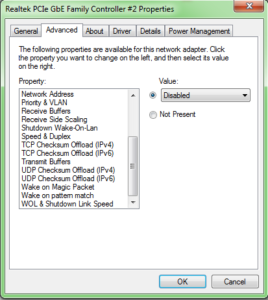 For the most part, it works as expected, but adding VLANs will normally unbind TCP/IP from the main adapter, resulting an inability to access the untagged network. The simple fix is just to open the properties for the adapter and rebind the protocol – that way you can access both tagged and untagged networks simultaneously. 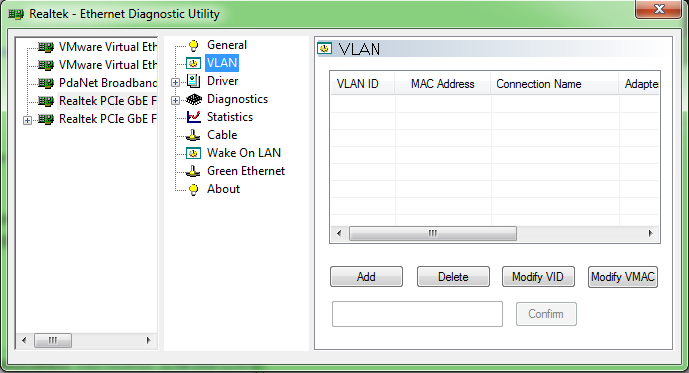 The functionality is equivalent to Intel ANS-based VLAN. 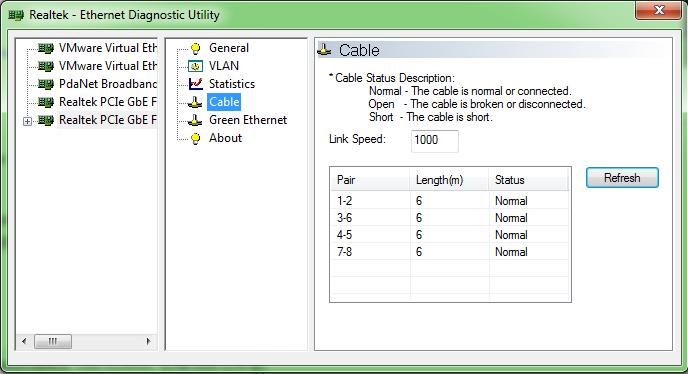 It’s also interesting to see that the adapter is capable of reporting cable length fairly accurately (actual length was 5m) – this can be accessed in the BIOS as well. 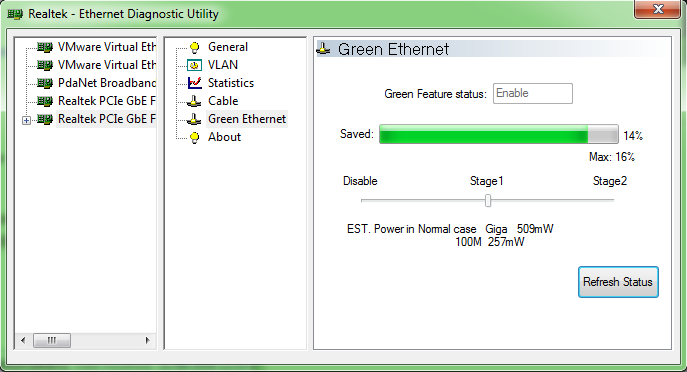 The Green Ethernet page also lets you see the power savings achieved from Energy Efficient Ethernet operation. It was rather disappointing to see that the maximum energy saving for this chipset is 16%, and in the case of my 5m cable, just 14% was being saved. I guess something is better than nothing though. 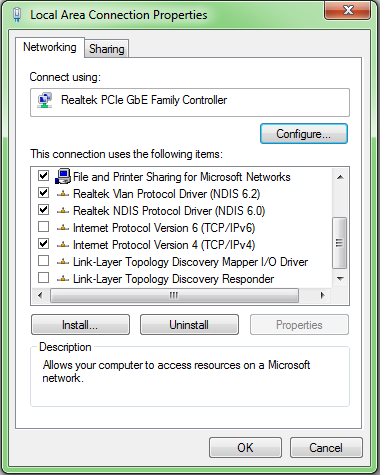 As a result, if you have a Realtek adapter, you might not need to miss out on the fun of multiple VLAN operation under Windows. The deception is in the fact that to configure this, you need to use the Diagnostic Utility, which isn’t an intuitive place to go looking for such a feature. 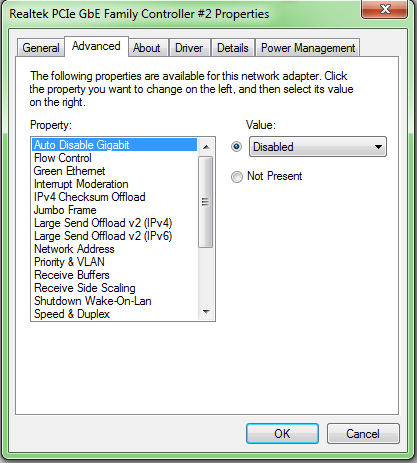 Once configured, the untagged network is not accessible by default due to unbinding of TCP/IP from the host adapter – you can safely rebind it and thus achieve both tagged and untagged operation simultaneously on the same adapter. So I guess in the case of the RTL8111D, it’s not bad news at all to have a Realtek. This entry was posted in Computing, Telecommunications and tagged computer hardware, networking. Bookmark the permalink. Given the poor security of AV network-connectable devices, it seems like a good idea to have a separate LAN for them that’s not connected to the internet. Too bad the ones I have don’t have provision for downloading a firmware file with a PC and using the device’s USB port to update firmware – instead of being exposed to the inet. I have a receiver & TV & I’m reluctant to connect them to the inet for that reason. But they’re working fine, so best leave well enough alone..